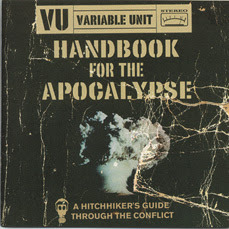 After the success of VU's debut album Seven Grain, they return with several new recruits, new music, and a new concept; Handbook for the Apocalypse: A Hitchhiker's Guide Through the Conflict. The current state of the world is unsettling, confusing, and scary. Are we on the brink of World War III? How will we equip and handle ourselves during a time of crisis? The answers lie within your hands. Please open your Handbook for the Apocalypse, place it in your CD player and listen to music that can guide you through these times. Handbook for the Apocalypse takes you into the trenches with thirteen diverse tracks that can only be described as politically charged organic hip-hop. From the opening drum march featuring wisdom by William Burroughs, Towers Open Fire sets you up for the first musical battle on this album. Following right behind is the lead single "Handbook for the Apocalypse" that showcases Command Surgeon Azeem's lyrical artillery. Socially consciousness poetry is showcased by Youth Speaks poets' Paul S. Flores on his piece "I am on a Journey to my Soul, but the Police Just Pulled Me Over," and on "Walking with my Son" featuring Marc Bamuthi Joseph. From the spiritual tones of Shake the Cosmic Dice" and "Beyond Babylon to the humorous skit of Hologram Network,"VU truly taps into our emotions, artistically expressing what many of us are afraid to say, but feel during this time of conflict. As recently seen in the peace marches in San Francisco and Washington D.C, people in our country are truly taking a stand against our government and most of all war. V.U.s Handbook for the Apocalypse is the perfect musical supplement and soundtrack to support peace, compassion, and unity. Take a listen and take a stand! Could you please upload this on Mediafire or similar?